Hematite stone is the main mineral in Iron and is mined in locations all around the world. The most notable places being Australia, Brazil, Canada, Chile, China, Cuba, England, Germany, India, Mexico, Spain and Russia. In the United States, the states where hematite stone mining is the most common includes Alabama, Arizona, Michigan, Missouri, New York, Tennessee, Wyoming and Utah. Hematite stone is always opaque and is a grey metallic color or almost black. Occasionally you will find small amounts of red within the stone. This is where the iron has oxidized and is why in times past, hematite was called “bloodstone” because many of the stones would “bleed” a red color when they were cut. The so called “bleeding” is actually nothing more than the iron oxidizing, which is nothing more than rust. Yet this red “blood” is where it got it’s name. It comes from the Greek word haima meaning blood. Our world has become so complex, it is hard to find time to take a deep breath, much less actually relax and let go of a little stress. The hematite stone can help you maximize those few moments you may find to let go of stress. It leaves you in a calm state but at the same time, it leaves you in tuned to the universal energies, allowing you psychic abilities to increase. If you have reached the age where your memory is not as good as it use to be, wearing hematite can help to increase your memory, making it easier to remember to get to appointments on time, to pay bills on time or even just to call your relatives on a semi-regular basis. Hematite stone is a balancing healing stone, that bring all sides of the subject into balance. Self control and a go getter attitude can live side by side. Body, mind and Spirit can all work in harmony. Not sure which path to take in your life to ensure you have all that you need? This also includes having peace and true inner happiness in your life. Hematite can cause your intuition to peak, helping you make the right choices to ensure all your hopes, dreams and desires can take you on the path to reach your goals. Hematite is a great stone for students, mathematicians and engineers or anyone that use a lot of analytical skills in their jobs. It helps with memory, makes memorization easier, improves mathematical skills and aids in logically moving from a single concept through the many possible conclusions that could arise. A hematite is a great stone for a beginner just learning to meditate. Often beginners will feel overwhelmed by the information and feelings they receive during their early attempts at meditation. Hematite helps you to stay grounded so you are not so overwhelmed, but at the same time, still allows you to maintain a meditative state. 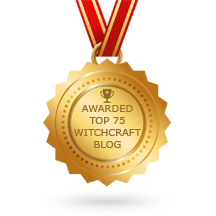 If you are ill, especially where fever is concerned or the if the body has a build up of toxins, have someone comb your aura while holding a hematite stone. If you don’t have someone to do this for you, meditate while holding one of the stones and visualize the stone drawing the fever/toxins/illness from your body and into the stone. Afterwards, make sure you wash the stone under running water to remove the build up of negative energy from it. If you are in need of a chiropractic treatments but can’t get one done at this point in time, lay on your stomach and have someone place several hematite stones on your back in a line down your spine. Hematite stone helps ease back pain and the magnetic qualities can help align your spine. Hematite stone works closely with the base chakra helping to keep you grounded. This makes it the perfect stone for someone who tends to have their head in the clouds. It helps them to keep their mind on what has to be done, without cutting off their love of life and flow of creativity. Hematite stone is great for anyone that does any sort of public speaking, including teachers, business executives and such. It gives you courage and self control while also reducing stress, which can help you to shine when communicating with others. 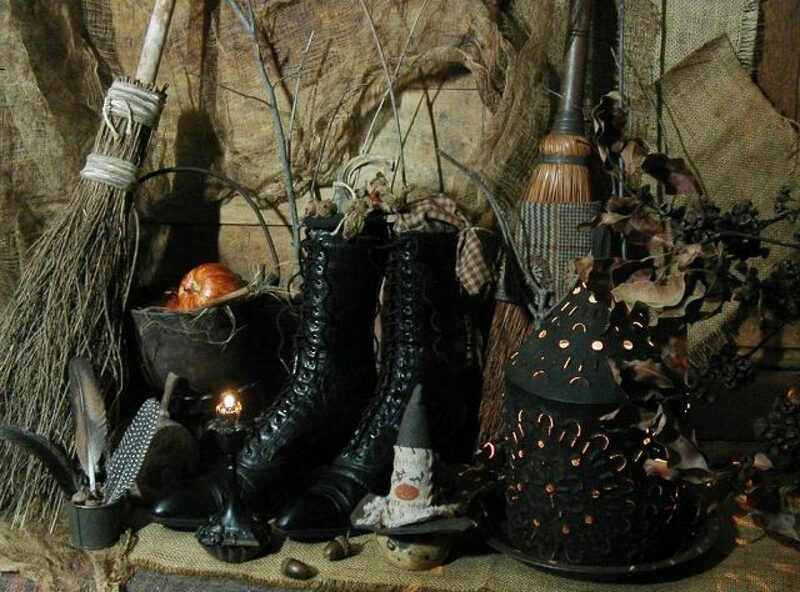 Posted on January 1, 2014 by ladyoftheabyssPosted in Articles, Crystals/Gems, Daily PostsTagged Alabama, Brazil, Chile, Cuba, Hematite, Hematite Stone, hematite stones, Mexico, New York, United States. Discover the cosmos!Each day a different image or photograph of our fascinating universe is featured, along with a brief explanation written by a professional astronomer. Explanation: Why were the statues on Easter Island built? No one is sure. What is sure is that over 800 large stone statues exist there. The Easter Island statues, stand, on the average, over twice as tall as a person and have over 200 times as much mass. Few specifics are known about the history or meaning of the unusual statues, but many believe that they were created about 500 years ago in the images of local leaders of a lost civilization. Pictured above, some of the stone giants were illuminated in 2009 under the central band of our Milky Way Galaxy. Posted on June 18, 2012 by ladyoftheabyssPosted in Daily PostsTagged Chile, Easter Island, Jo Anne Van Tilburg, Milky Way, Moai, South America, Statue, Valparaíso. 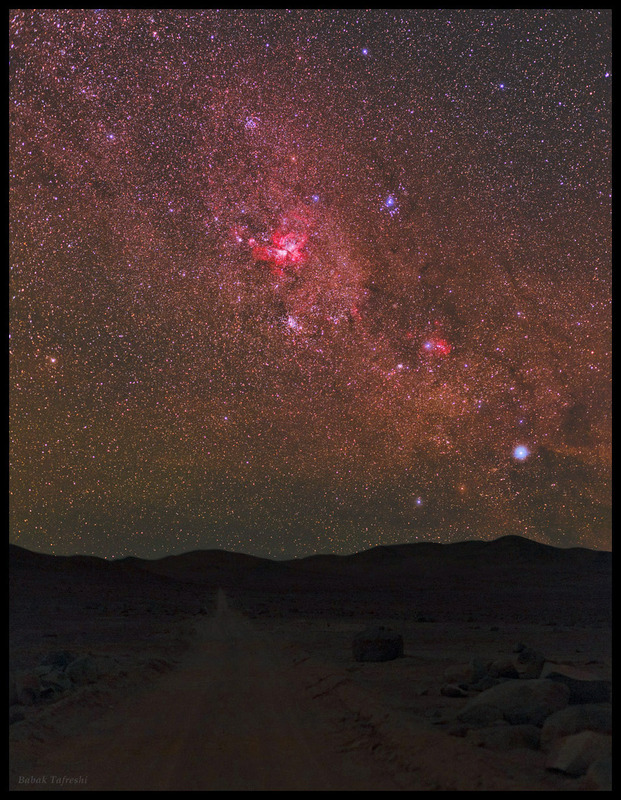 Explanation: This rugged road through the dark Atacama Desert seems to lead skyward toward the bright stars and glowing nebulae of the southern Milky Way. If you follow the road you will get to Cerro Armazones peak in Chile, future construction site for the 40-meter class European Extremely Large Telescope. For now though, sliding your cursor across the image will identify wonders of the southern skies in view. The scene is dominated by the reddish glow of the Great Carina Nebula, one of our galaxy’s largest star forming regions. In fact, the remarkable skyscape is not a composite of varying exposures or a photomontage. Far from sources of light pollution, the landscape illuminated by starlight and the Milky Way above were recorded by a modified digital camera and fast lens. The sensitive system captured both planet Earth and deep sky in a relatively short exposure. Posted on February 18, 2012 by ladyoftheabyssPosted in Daily PostsTagged Astronomy Picture of the Day, Atacama Desert, Carina Nebula, Cerro Armazones, Chile, Earth, European Extremely Large Telescope, Milky Way, Star formation. Explanation: Will our Sun look like this one day? The Helix Nebula is one of brightest and closest examples of a planetary nebula, a gas cloud created at the end of the life of a Sun-like star. The outer gasses of the star expelled into space appear from our vantage point as if we are looking down a helix. The remnant central stellar core, destined to become a white dwarf star, glows in light so energetic it causes the previously expelled gas to fluoresce. The Helix Nebula, given a technical designation of NGC 7293, lies about 700 light-years away towards the constellation of the Water Bearer (Aquarius) and spans about 2.5 light-years. The above picture was taken three colors on infrared light by the 4.1-meter Visible and Infrared Survey Telescope for Astronomy (VISTA) at the European Southern Observatory’s Paranal Observatory in Chile. 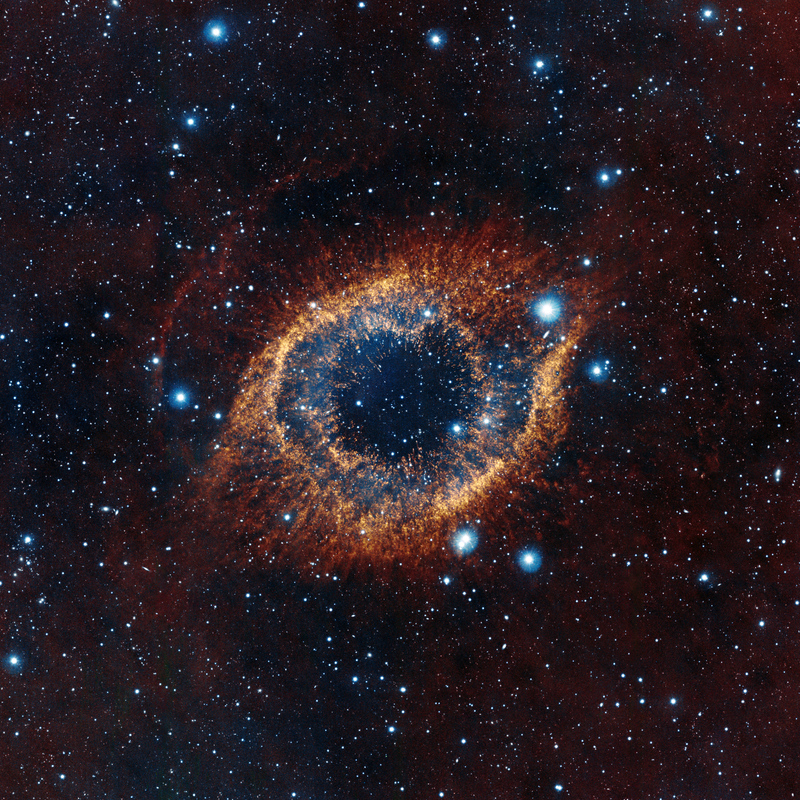 A close-up of the inner edge of the Helix Nebula shows complex gas knots of unknown origin. 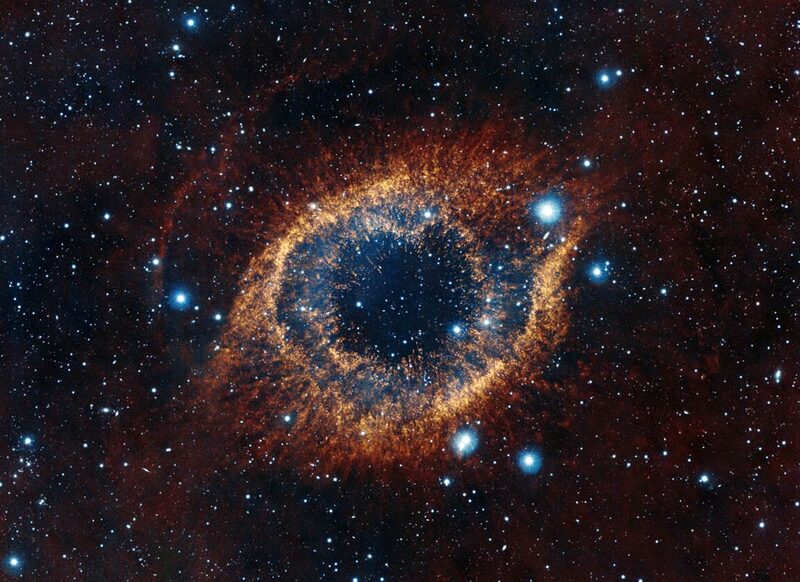 Posted on January 31, 2012 by ladyoftheabyssPosted in Daily PostsTagged AQUARIUS, Astronomy, Astronomy Picture of the Day, Chile, European Southern Observatory, Helix Nebula, Paranal Observatory, VISTA.